Used by stations for 16 years to expand their High School football coverage. The app allows you to easily manage both scores and schedules, while the application takes care of hosting hundreds of pages of content for your station. Display schedules on your site for every team. Team pages are created automatically by the data you enter. No need to manually create a page for every school in your coverage area! Users can view games by date, or by school. 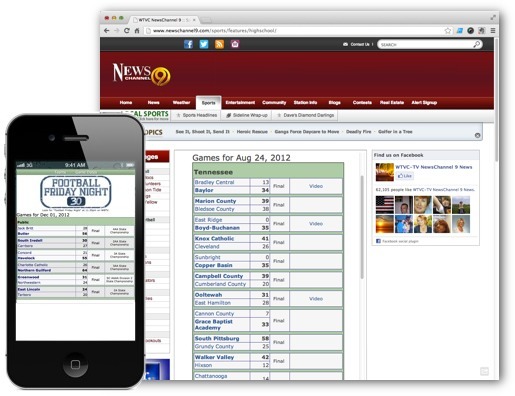 When displaying all the games by date, users can click on any of the schools listed to go directly to their schedule. From the schedule view, you can also click on any of the dates to see all the games being played on that date. For information on how you can make this Football Internet application available on your website, email .